After battling the forces of nature and tourism, duelling shopkeepers for foreign treasures, running through gauntlets of chaotic traffic, relaxing in exotic gardens, packing all our dirty clothes Tetris style and racing to the airport in cars held together by rubber bands and chewing gum, we’ve finally decided to take a break and have some lunch. But no standard lunch will do, oh no, only PANCAKES will do for lunch! And so our quest begins anew, to find the best pancakes in Kathmandu, not easy considering few would dare eat such delicious deserts at midday with the sun still high in the sky. But we’ve survived harder challenges, such as para-hawking above Pokhara, climbing high above the clouds beneath the Annapurna ranges in a single day, drinking the water out of the tap and we’ll not be defeated this time! P.S. The Pancakes, infused with chocolate and banana, are Scrumdilliumptious! Andrew and Toria walked up and down the main street of Pokhara interviewing trekking companies to decide how to spend our two days of hiking. Like with most things we were impressed by the company that appeared to know their product the best, a “guide operated” company (as advertised). We met our guide Dahl (easy for us to remember) at 8.30am after a rushed but beautiful breakfast lakeside. With our breakfast barely down we sat on a bouncy local bus with the “conductor” yelling out the destination and “jam jam”…”go go” for an hour winding our way up to a village where our walk would commence. When we reached the village we started the trek like all things in India and Nepal, by sitting down and having a glass of masala (spice) chia (chai/tea). Winding our way up the mountain paths we chatted to our guide and took in the amazing views of the Annapurna range, the rolling countryside and villages around us. For lunch we reached a guesthouse which appeared to have no occupants just the owner reclined on the front porch. We ordered our dahl baht (the standard lunch fare) and watched as he went to his veggie garden to pick the ingredients. One hour and forty-five minutes later lunch was served. No one was really in a hurry. Three more hours of trekking up hill through different biospheres (including rain forest) brought us to our guest house nestled in a saddle next to Panchese. In the same way we started our walk we finished our walk with masala chia, refreshingly warming after the light rain we finished our walk in. We wondered around the village taking it in from all angles, greeting the cows and admiring the ordered of chopped wood, crops and fences. 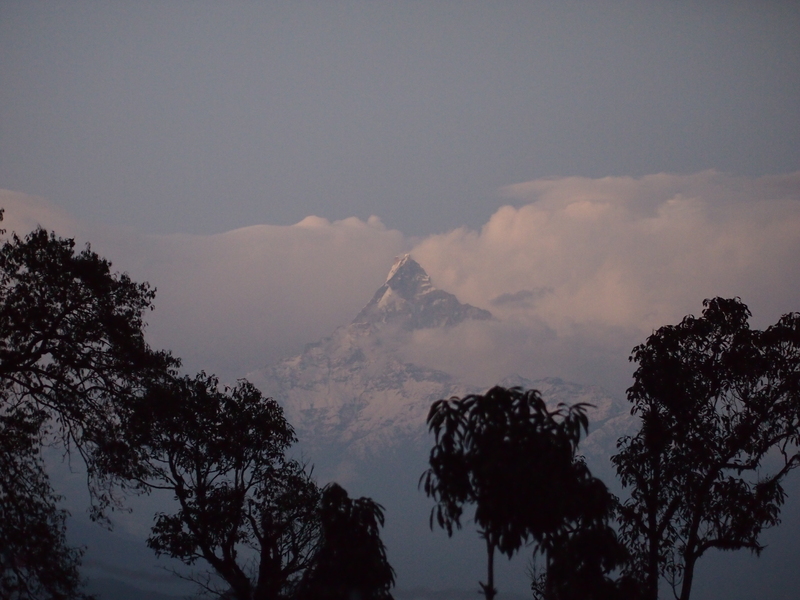 In the last light of dusk the clouds lifted from the Annapurna range, the snow glowing white and we were awe struck, having to remind ourselves that this was not a painting on a canvass. Later the stars glowed bright in the sky, our new friends from the US schooled us on the stars of the North. Early to bed and early to rise, our alarm rang at 4.50am for the ascent to the Panchese peak for sunrise. At 5.25pm we were ready to leave our guide behind however he finally appeared after he overslept. We arrived at the peak in time to see the sun rise and the mountains wake, red strewn across the sky. We stayed for an hour watching the colours in the sky and on the mountains change. Of course on the peak with no one else but us we met a man from Tassie, (Nepali people think that Australia has a large population because so many Aussies are in Nepal) and had a great conversation about trekking and the plight of developing nations. The trip down was hard on the knees however even more beautiful than the day before because you could take in the view while you walked. We reached a natural dam in a beautiful clear stream and were ever so tempted to go swimming, however did not as the temperature is still quite cold here. At the bottom we consumed yet another dahl baht (this time with chicken) and chia masala before boarding the local bus back to Pokhara. We bounced along a creek bed, which during the monsoon would be inaccessible by bus, basking in the novelty, which on reflection would be a really hard way to live, having to commute to the closest city like this. 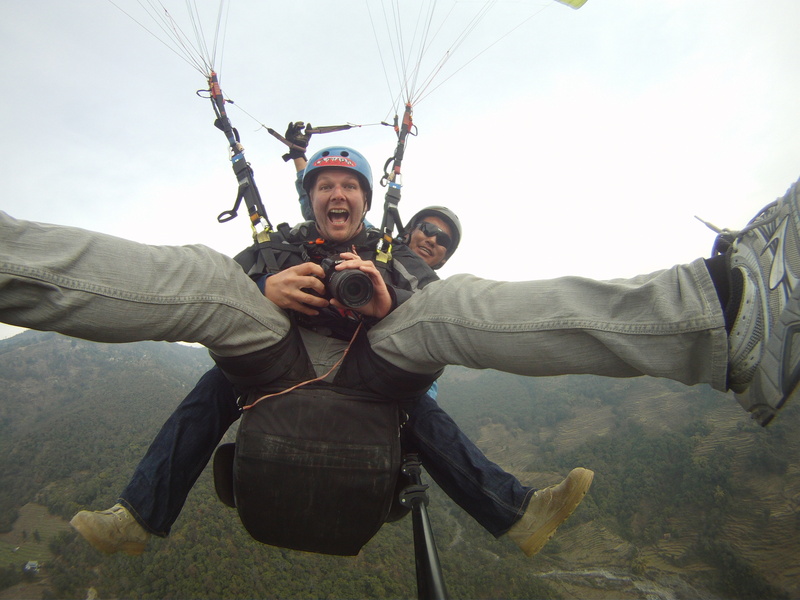 We were very excited to meet up with Matt again who had his own adventures while we were gone – paragliding! Now I am on a plane carrying 30 people on a 22 minute flight to Kathmandu (the alternative is a 6-8 hour bus journey), it is with a heavy heart we say goodbye to Pokhara and the Annapurna sanctuary and promise that we will return one day.